En Irismark i Spanien: Årets første iris! Well the warm should not be that much a problem, but they need water during vinter and early spring, maybe thats why they dont grow?? I lose them in summer.....when it's autumn, they don't exit yet. Or perhaps I can't grow them. In Murcia is hotter than where you live, and summer is very hard. Its a bit strange because they are use to the warm summers, but maybe its too hot in your area. Many factors can be involved regarding growing these iris, the soil needs to be above 6,5pH, they need water in autumn and during winter, fertilizer when finished flowering and dry summerrest!! Maybe you should grow them behind some large stones so the bulb are kept a little more cold?? Ja for os nordboere er det uvirkeligt med en iris nu, hvor er den skøn. Vil du kigge ind på mit indlæg og se på den ene hvide iris, jeg har med i dag. Karsten vil gerne vide, hvad den hedder. Måske kan du hjælpe. Har du fået frø gennem AIS? Ja den er rigtig flot, det er en jeg har købt hos min gamle ven Janis i Letland ,han sælger de hybrider fra Alan, priserne er dog noget høje,Jeg får nok også snart blomst på "Evening Twiligt" og"Sea Green"
Skønt og dramatisk januar-under! Virkelig en stærk form og farvekombination. Ja det er en tidlig iris, og jeg er helt vild med de her farver i netop reticulata-iris. Hvor er den flot. Og slet ikke så tosset, at vi får forskuds-forår igennem din blog. In Denmark it was also normal to ses reticulatas in bloom during marts, and this one is very early even here in Spain, maybe because of the warm winter that have been so far!! 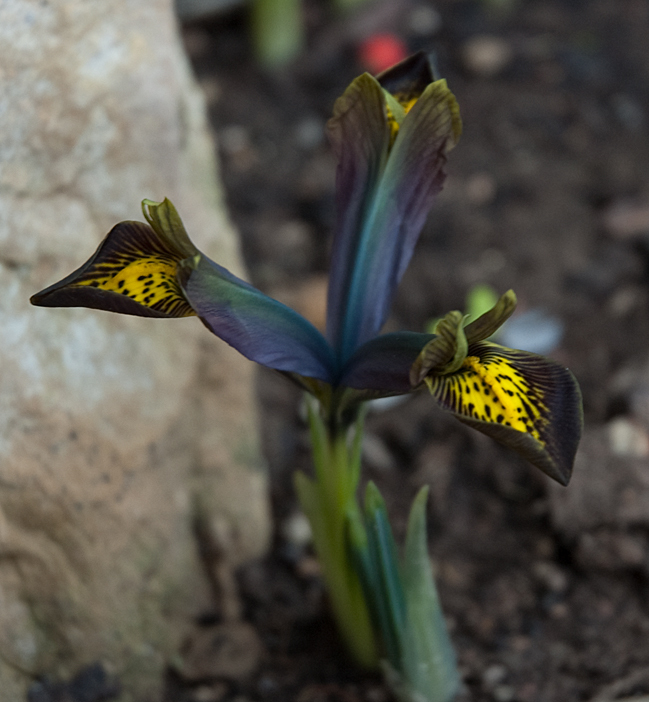 Congratulations on the first Iris of the year! Its colours are very beautiful, especially the blue/purple/green on the outside of the flower. One of my favourite colours, specially in this section of iris where mostly are blue/violet,and it is a very early blooming even here in Spain!